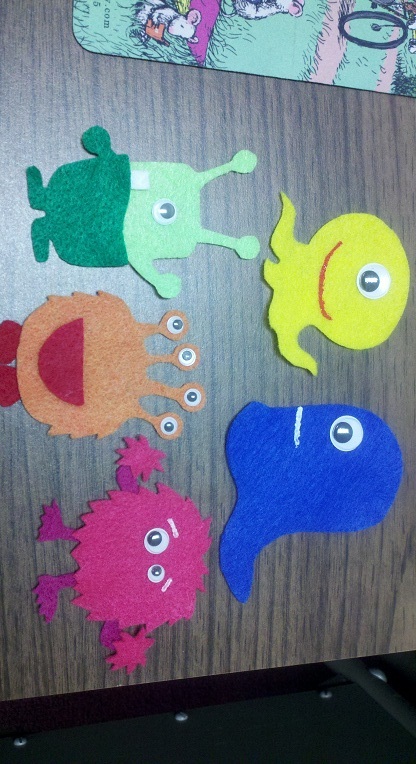 I originally was not going to make a template for my Five Little Monsters flannel set. Partly because I’m not all that great at templates, but also because I based this flannel set off of some clip art I found online. I’m still unsure of the legality of posting a template of someone else’s clip art (even if I made a few changes). But Caitlin asked so nicely for a template that I decided to go ahead and go for it! If it turns out that I am infringing on someone else’s copyright, then I’ll take it down. Now, this isn’t a great template. I drew it out by hand, and I didn’t have a scanner, so I ended up taking a picture of it with my phone and making a template with that image. Still, it should work. Thank you so much! Even though I did a monster-themed storytime a few months ago, I’m going to have to do another soon just so I can use these :).